There may be more white than green out there, but according to the calendar, spring has sprung! And despite a low thermometer reading, we are making preparations to welcome the season. That means sourcing ingredients for our upcoming spring menu. This week we visited Greenhouses Canada, recently located in the Ben Moxam Community Centre in Lively. Produce here is grown indoors using organic techniques and an aeroponics system. Since it is grown in a controlled environment, produce is available year round without fluctuating costs. A special type of lighting can influence the coloration and flavour in the produce. Want your arugula extra spicy? Wheatgrass, specialty lettuces, herbs and beans are thriving inside a classroom in this former elementary school. And there are plans to expand the operation to include trough systems to grow produce like peppers and tomatoes. Operations manager Cassandra Whymark tells us they recently moved from Espanola to Lively and with the larger space, have the capacity to accommodate specific requests. We are looking forward to working with them! In the meantime we are planning our patio gardening and keeping an eye on our rooftop apiary. Cassandra Whymark is operations manager at Greenhouses Canada in Lively. Interested in learning more about Greenhouses Canada? 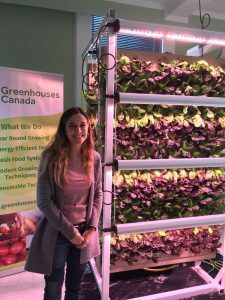 Established in 2014, Greenhouses Canada combines energy efficient building technology with a passion for local food access to generate high quality, ecologically sourced produce revolutionizing how communities access fresh food year-round.